New Zealand is a country that appears to be made for a motorcycle. Because of its mountainous nature, the roads twist and turn through one area of spectacular scenery to another. Auckland Motorbike Hire has a range of modern motorcycles to tour around New Zealand. Touring New Zealand on a motorbike can be done in a 12 to 14 day period starting and finishing in New Zealand's largest city, Auckland, and allowing you to see the best of what New Zealand has to offer. However a longer stay will allow you to soak up more of the local motorcycling events including the Burt Munro Challenge in November, classic motorcycle events in February and also some fantastic street circuit racing in December and February. Enjoy the natural beauty that the different regions have to offer on one of our range of adventure bikes. New Zealand is made up of two main islands, The North Island and The South Island. The combined total land area is 270,534 sq. kms (104,454 sq. mls - approximately 36 times less than the US). It is similar in size to Colorado and somewhere in between the size of Japan and the United Kingdom. New Zealand has a population of 4 million with 1.1 million living in the Auckland (New Zealand's largest city). The North Island has some great areas to ride like the Coromandel Peninsula, the East Cape and Northland. 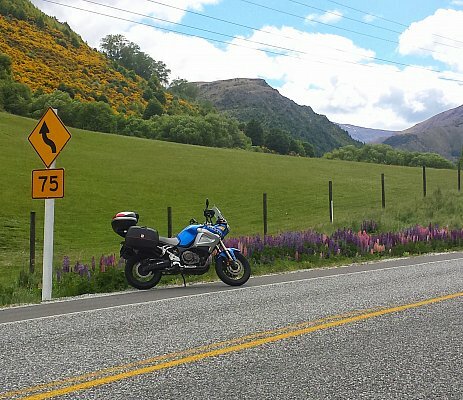 The best name for a road anywhere surely lies with the central North Island's "Forgotten World Highway," fast becoming a must do for any motorcyclist! The South Island's outline is a mix of beautiful, idyllic beaches and a rugged and wild coastline. The Southern Alps(larger than the French, Austrian and Swiss Alps combined) run down the length of the South Island and form a magnificent back-drop to rain forest, tussock covered highlands and central South Island lakes that are a colour you wouldn't think possible in nature. These factors combined will ensure you have a fantastic motorcycle tour! To see what New Zealand has to offer, contact us at Auckland Motorbike Hire to start planning your New Zealand Motorcycle tour. New Zealand experiences summer from December - February and winter from June - August. Some of the best months for motorcycling however are March, April and May when the weather is still fine and settled, but without the humidity that mid-summer can experience. The climate is temperate with little extreme. Any huge variations in temperature can be accounted for by the combination of the mountainous geography and prevailing westerly winds.